For other uses, see Enemy of the people. 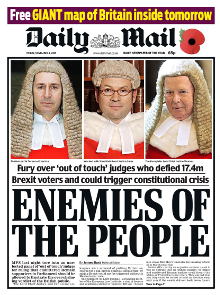 "Enemies of the People" was the headline to an article by the political editor James Slack, published in the British newspaper Daily Mail on 4 November 2016. The headline and associated article were about the three judges who had ruled that the UK Government would require the consent of Parliament to give notice of Brexit. The headline was widely criticised as being inappropriately condemnatory and attracted numerous complaints, given that the British judiciary is independent of the Government. The court had ruled on the question of whether the Constitution of the United Kingdom permitted the government to use the royal prerogative to invoke Article 50 (or whether it would need to be authorised by an explicit act of Parliament to do so). The headline, written by James Slack and approved by editor Paul Dacre, was in response to the ruling of the High Court of England and Wales in the Miller case that the government would need to gain the consent of Parliament before it could trigger Article 50 and exit the European Union (EU). The government had intended to use the royal prerogative to invoke Article 50, after a referendum in June 2016 had resulted in a slight majority vote to leave. The Daily Mail claimed the court's decision purposefully blocked the Brexit process and ran the story and headline about the three high court judges – the Lord Chief Justice, Lord Thomas, Master of the Rolls Sir Terence Etherton, and Lord Justice Sales. The Mail's website also initially described Etherton as an "openly-gay ex-Olympic fencer", but this was changed after criticism on social media. Former Lord Chief Justice Igor Judge said the newspaper's attacking comments, particularly the homophobia concerns, were "very unpleasant". The Independent Press Standards Organisation received over 1,000 complaints about the piece, claiming it violated numerous Codes of Conduct including inaccuracy, harassment and discrimination. A Business Insider report strongly criticised the Daily Mail story as being "distorted" and could be construed as an attempt to harm the reputation and safety of the judges. In November 2016, the Bishop of Leeds, Nick Baines said the public should be "very alarmed" over the Daily Mail piece. Lord Neuberger spoke out about the press criticism of judges in an interview broadcast by the BBC in February 2017. In response to the criticism of the High Court ruling by newspapers, including the Daily Mail, the Secretary of State for Justice, Liz Truss issued a three line statement defending the independence and impartiality of the judiciary more than a day after being asked by the Bar Council to comment. The chairwoman of the Bar Council, Chantal-Aimee Doerries QC, said that Truss should have clearly defended the judiciary and condemned the attacks made by the Daily Mail and similar stories in the newspapers Daily Express and The Sun. Truss' brief response was seen as inadequate. Former Conservative minister Anna Soubry said that Truss "has a duty to condemn the vilification, including a homophobic attack, of our judiciary". Lord Thomas later condemned Truss' comments, saying she was "completely and utterly wrong" to say the media could not be criticised. The government appealed against the High Court decision. In January 2017, the Supreme Court dismissed the appeal, which Lord Neuberger summarised as "the government cannot trigger Article 50 without an Act of Parliament". The Bar Council launched a scheme to teach secondary school children about the importance and impartiality of the British judiciary. At the end of January 2017, it appeared that Slack was to be appointed as prime minister Theresa May's official spokesman, which was confirmed on 10 February. On 19 April 2017, following the Prime Minister's decision to call a snap election, the Daily Mail ran a similar Brexit-related headline, "Crush the Saboteurs". This did not attack the judiciary but focused on the "unelected" House of Lords and called people who voted for Britain to remain in the EU "remoaners". ^ a b Phipps, Claire (4 November 2016). "British newspapers react to judges' Brexit ruling: 'Enemies of the people'". The Guardian. Retrieved 3 February 2017. ^ Fay, Stephen (March 2017). "Moralist, monarchist and Brexiteer-in-chief". The Oldie: 34. ^ a b c "Daily Mail's 'Enemies of the People' front page receives more than 1,000 complaints to IPSO". The Independent. 10 November 2016. Retrieved 3 February 2017. ^ "Is Donald Trump 'Mr. Brexit'?". The New York Times. 27 January 2017. Retrieved 3 February 2017. ^ Duffy, Nick (3 November 2016). "The Daily Mail is very upset because an 'openly gay judge' ruled on Brexit". PinkNews. Retrieved 9 February 2017. ^ Nelson, Sara C (3 November 2016). "MailOnline Attacks Brexit Judge For Being 'Openly Gay'". Huffington Post. Retrieved 9 February 2017. ^ Blair, Olivia (4 November 2016). "J.K. Rowling responds perfectly to Mail Online headline referencing judges's sexuality after Brexit High Court ruling". The Independent. Retrieved 9 February 2017. ^ "Former Lord Chief Justice Attacks Homophobic Campaign Against Brexit". Pink News. 8 November 2016. Retrieved 14 February 2017. ^ Breeze, Ruth (April 2018). ""Enemies of the people": Populist performances in the Daily Mail reporting of the Article 50 case". Discourse, Context & Media. doi:10.1016/j.dcm.2018.03.008. ^ "People are furious at the Daily Mail front page branding the Article 50 judges 'Enemies of the People'". Business Insider. 4 November 2016. Retrieved 3 February 2017. ^ "Attacks on judges undermine law – Supreme Court president". BBC News. 16 February 2017. Retrieved 16 February 2017. ^ "Liz Truss defends judiciary after Brexit ruling criticism". The Guardian. 5 November 2016. Retrieved 11 February 2017. ^ "Brexit ruling: Lord Chancellor backs judiciary amid row". BBC News. 5 November 2016. Retrieved 3 February 2017. ^ "Brexit: lawyers confront Liz Truss over 'dangerous' abuse of judges". The Guardian. 5 November 2016. Retrieved 3 February 2017. ^ Bowcott, Owen (22 March 2017). "Lord chief justice attacks Liz Truss for failing to back article 50 judges". The Guardian. Retrieved 27 April 2017. ^ "Brexit: Supreme Court says Parliament must give Article 50 go-ahead". BBC News. 24 January 2017. Retrieved 3 February 2017. ^ "Barristers launch PR drive in schools to explain why judges are not the 'enemies of the people'". The Daily Telegraph. 24 January 2017. Retrieved 3 February 2017. ^ McTague, Tom (31 January 2017). "Theresa May gets her Alastair Campbell". Politico. Retrieved 31 January 2017. ^ Asthana, Anushka (31 January 2017). "Journalist James Slack tipped to become Theresa May's spokesman". The Guardian. Retrieved 31 January 2017. ^ "James Slack will be the new Prime Minister's Official Spokesperson". H,M. Government. 10 February 2017. Retrieved 10 February 2017. ^ Poole, Steven (19 April 2017). "Crush the saboteurs! How hard-Brexit rhetoric turned Leninist". The Guardian. Retrieved 27 April 2017.